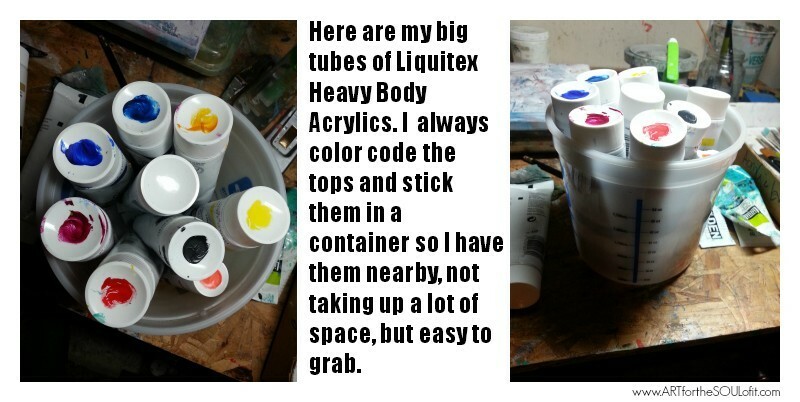 Liquitex Heavy Body Acrylics – I just LOVE their creaminess and uber awesome tubes and caps. Since these are my basic colors I splurged on the larger tubes, 4.65 oz. Got them locally for 55% off, too! A steal. Then I picked out a warm and cool of each primary color, always nontoxic, and single pigment (much cleaner mixes). Think about this – if for your basic palette you use primary colors that are already a mix of say, 3 pigments, then you mix that with another primary of 2 pigments, well, you just won’t achieve as clean and clear a mix. Make sense? I am rather geeky about looking up the pigments used in each color and for my basic palette I hunt high and low for single pigments only with strong lightfastness, too. DickBlick is fabulous for this research. And check out Handprint. I do this for every medium I use and already had my gouache and oil palettes figured out. My thoughtfully chosen acrylic palette of paints, single pigment and warm and cool. This is called a Split-Complementary (or Split Primary) Palette. Two colors of each primary, with a warm and cool pigment quality. BV (blue violet / warm) – Ultramarine Blue – you can’t do without this color, mixes beautifully into everything, on it’s own it doesn’t inspire me like…. BG (blue-green / cool) – Phthalo Blue – I admit it, I’m seriously addicted to this, and all blue-greens and turquoises and teals and aquas…. It is quite strong and takes a bit of practice to tame it. You may wonder….YES, I mix my greens. I used to love Sap Green, and still do, BUT upon looking up the pigment mix it’s Yellow, Ph. Blue and Black. Well, duh, I can mix that myself. See? Titanium White – I don’t bother with mixing whites as Titanium does the trick. However, it’s a good idea at times, if things in your painting are cooling down too quickly, to add a smidge of a yellow into the white mix. Mars Black – as a passionate animal lover I choose not to use Ivory Black which is burned up animal bones. So sad! And Mars is lovely, more transparent, and mixes some gorgeous tones, whereas Ivory Black mixes up muddy. And oh my, black and yellow – scrumptious olive-y greens! I am unapologetically a BLACK paint lover, oh yeah. You see that cute little tube of orange in pic below? Pyrolle Orange, just because – I was at the art store and just had to buy something! All art supply addicts know this one. Lovely bright clear orange, and fab mixer. And if you like dark colors, a gorgeous chromatic black can be mixed with Phthalo Green and Quin. Magenta. I have been using Liquitex white and black gesso (in ketchup squeeze bottles) rather than white and black paint. Love it! Makes the overall quality matte, which I spiff up at end with a satin varnish. And omg, LOVELOVELOVE Liquitex Super Heavy Gesso. It's like modeling paste thick. BV - Indanthrene Blue rather than Ultramarine, it's a bit more muted and darker. I love it. It's fun to change up my palette once in awhile. Y - a good all around yellow not leaning Orange or Green, is Cadmium Yellow Medium Hue (which would be a good ONE YELLOW to simplify your palette.) This IS a blend of 3 pigments, however, but seems to mix clean and has a very cadmium - as in opaque - quality. So if you are missing your cadmium, this is very nice. I was looking for palette ideas and this really helped me! So glad it hwlped you, Rose.